Opponents of California’s so-called “bullet train” went to court contending that the funding plan for $68 billion high-speed rail project violated the ballot measure voters approved in 2008. A Sacramento court agreed, but the Third District Court of Appeal overturned the ruling. 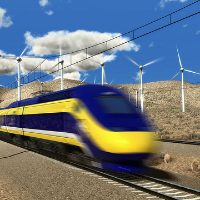 Now, as the Sacramento Bee recently reported, the California Supreme Court let the appeal stand, and that has high-speed rail bosses feeling good about themselves. Dan Richard, chairman of the board of the California High-Speed Rail Authority, said they would move “aggressively” to build “a modern high-speed rail system that connects the state, creates jobs and complies with the law.” Stuart Flashman, attorney for opponents of the project, told reporters the decision was “bad news for California’s voters and for the state’s financial future.” He’s right about that. Dan Richard said the train is supposed to “connect the state,” specifically Los Angeles and the San Francisco Bay Area. The first section of the project, however, is out near Fresno. This confirms that a primary purpose is to connect California congressmen with money, so they can show that they are bringing home the bacon for their districts. As we noted, the project is also a soft landing spot for washed-up politicians such as board member Lynn Schenck, a former congresswoman and chief of staff for California governor Gray Davis. And of course Governor Jerry Brown sees the bullet train as one of his legacy projects. Suppose the bullet train did connect Los Angeles and San Francisco. It remains dubious whether it could make that trip in two hours and 40 minutes, as ballot measure 1A stipulated. In the style of Obamacare, you have to spend the money and build it before you find out how fast it goes. As it happens, two hours and 40 minutes is more than twice as long as it takes to fly between the two cities, but by all indications the bullet train will be more expensive than air travel as well. And if anybody thinks the final cost of construction will be $68 billion, the state has a bridge to sell you.